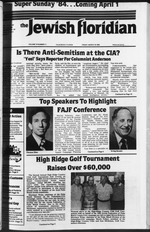 Is There Anti-Semitism at the CIA? others who had lived there." him to that slot in 1981.
to be part ot'this super day." Lis' u.-i .nairs the Kesea:. in Israel through Project Pe^e. Share the vision with us! whole of the Jewish people. Gregg I ariuk.iw proudh displavs his vtMM|ftP"
the message ol Super Sundav. understand their responsibility here as well. ich County-United Jewish Appeal campaign. brice Lukalch. Doppelt, Lillie Reader, and Danny Matarasso. Josepn penman. land Naomi Kesslerand Doiis and Jerry Perlman. geriatric home in Cherry Hill. New Jersey for three years. the Royce Hotel, West Palm Beach. ( ) 8:45 A.M. to 11:30 A.M.
( ) 10:45 A.M. to 1:30 P.M.
( ) 12:45 P.M. to 3:30 P.M.
() 2:45 P.M. to 5:30 P.M.
( ) 4:45 P.M. to 7:30 P.M.
() 6:45 P.M. to 9:30 P.M.
Sunday", if they have not already done so. occupying power in southern Lebanon. tremely vocal on this issue. such as the Strait of Hormuz. signed: What is Syria doing in Lebanon? honor in every sense of the word. the most turbulent years in Jewish history. during that era than he did of hiTJ? Second Ca. PMUM P..0 .1 Boc. Ren F.aW^KnSj*"
years, died last week at his Century Village home-*! Junior College School of Nursing. student at the Jewish Community Day School. IAYIM Sunday, Mar. 18, 7:300 a.m.
ji o m WHRS-FM Stereo 91 with host Dr.
Ilverman. NOTE NEW TIME SLOT. m Temple Beth El Public Lecture 7 p.m.
Beth Sholom Men's Club 9:30 a.m.
iFamily and Children's Service board 7:30 p.m.
r Women Theodore Herzl board 10 a.m.
, Women Ezrat Purim party 5:30 p.m.
Cresthaven B'nai B'rith No. 3115 8 p.m.
1 Hadassah Shalom 1 p.m.
which are held at the museum. equal treatment to the public. Anyone between the ages of 18-65 can volunteer. Helen Stedman Cluett, at 305/833-6952. to take a position in industry. and the mother of three boys. enlarging and renovating to fit their needs. ever in that neighborhood. She found a shocking situation. family were, or had been, in jail. Shop*' a euphemism for a drug and gambling center. The situation looked almost hopeless. ot South Broward wa- on the hori/on. into the project in 1979.
on. Palm Beach Count) joined in the partnership. and looks forward to the continuation of the "twinning"
long alter all the renovation has been completed. Broward Federation and has manv friends in the \-!. leadership training course will begin this month. Ziona is determined to get the project going at full steam. help, we know that she'll succeed. debated in the Senate; rather. lln the U.S. and Canada. <,; 1 A W m #. Brussels, Munich, Zurich, and Kuwait. Music and Culture Hour on WHRS FM. tea for new and prospective members. Bank in Cross Countv Mall at I p.m.
MaTdrto ni ISP! Ch,b Wlll.h0l,d ? Dessert Card Pa"> 0"
be plerm of parking space. "Changing Sexual Patterns." Refreshments will be served. the piano by Jerry Carretta and the Ben Zuger orchestra. Palm Beach County, will speak about Punm. are invited and refreshments will be served. and show your interest for Israel. information and reservations contact Ann or Jean. or Lillian at 689-""00 |W. W OF THE PALM BEACHES, INC.
tive to the Rabbi's suggestion. Over Visit With Your Child! to a wide variety of athletic activities. counselors is an extraordinary 6 to 1! fTTO Jl -"- ^ ~s: i*^s"
description of life in Shusha.'.. Friday 8:30 a.m.. 5 p.m. and a late terra*! followed by Oneg Shabbat. Saturday: 8:30am Si. Rabbi Nathan Zelizer. Phone 793-9122.
i.arv I) Kessler Sabbath services. Frida;! 1 nday night aan icaa B 16 p m.. Saturday, yam. 1 ONGREGATION BETH ISRAEL 1592 FlorvsuJ'0! 33460 Phone 461-7428. Cantor Anne Newman. Episcopal Retreat. Forest < Hill Blvd. Phone K.j;iH421 Rabbi Howard Shapi. l"
a wall in the lobby area. in ureed to attend in costume. ial portrait, taken in 1933. Monday, March 19. at 1 p.m.
(enter, will be the speaker. Groups. There will be games. Service will beam at 9:30a.m. on March 18 from 10 a.m.
called, "To Be A Mensch." Funeral Chapel. Weat Palm Beach. Merlon B 4J. tt Weat Palm Beach. Rhoda Vi. of i4(B Hlfh Point Way. tion during th ir confinement. iox ma> be Officer P.O. ... the perspective of an Israeli mother. another, is central to Purim's message. strength which we continue to cherish. all be read in one breath. Barcelona Hotel. 44th St at Collins Aw. Miami Beach. single word must be heard. Spring Fed Lake: Swim, Sail, Canoe, Windsurf. Olympic Pool: Swim Team, Scuba, Snorkel, Nlte Swims. Sunday '84 "They've Got Your Number, South r lonaa. come up for a full Senate \ote. versary of the birth of Dr. dignity." There is a Dr.
to a total of 50,000 families.
. economic gap in Israel." and a handful of students. diet would also be beneficial. group that received it in the first year. bilitaung side effects from the drug. Fetnre virtuosos take Wednesday afternoon guitar lessons. The Wednesday Karate class gets ready for aclion. Mark Kirsch and Alan Pariser. former past president of Israel Bonds; Mrs.
its limited security needs there. own goals for peace, he said. process to go forward in 1985. "In an election year, the U.S.
Children under 12, in same room with parents, from $275. the Soviet Jews on March 15.
for Soviet Jews, on March 15.
leave from the Soviet Union. BOUNTIFUL EXTRAS FOR TEENS A CHILDREN! the professionals at the CIA. Reagan to head the agency. ward with the McNeil charges. to celebrate Purim, a festive time. All will join in the making of Purim masks and groggers. $2.50 for adults and $1.50 for children. Federation of Palm Beach's Super Sunday. do windows, wash floors, wash cars, etc. do a chore and do a Mitzvah. Center, 2415 Okeechobee Blvd., West Palm Beach. Proper Nutrition and healthy exercise. Sorry, but all entries will become the pronJ! our upcoming Bridal Supplement in April. married recently or 25 years or longer. Wcji! daughter, sisters) at their own weddings. up after publication at our office. 2550 OKEECHOBEE ILVD.. W. PALM IEACH. FL. L" by Beverley Sills will be reviewed by Ms.
[lets, call Belle Kreit or Rae Lesser. ^rth, Bldg. C6 Apt. 211. All members welcome. , For more information call Laura London. details contact Ann Miller, Camden H-186. fpaints and prints to be auctioned off. i sale, (no clothing) call Rita Kellner or Gwen Satz. i new or almost new article to be auctioned. the Donor Luncheon, to be held on April 26.
knal Purim refreshments will be served. lura Stone of Palm Beach County, Inc.
==a3 TM OCEAN T nmt STUUT. much tees when you ifay and play at Stevenevwe. CS. A question and answer session followed the presentations. Sat Evening Mar. 17th 1984 at 8 P.M.
Our chape, on OHeechooee Biv: .,.. Sunday '84 "They've Got Your Number. South Florida. come up for a full Senate vote. Under North & South County Rabbinical! results had been "aanoualy awaited." lowering cnuiesu i at wveis. I ""organ |. Levy, C.C.D.